Shazam! is finally in theaters and we need to talk about those post-credit scenes. Comic book movie lovers have become totally accustomed to sitting through the credits after Marvel or DC movies. Sometimes this is for nothing, sometimes it means big things for the future. In this particular case, it's a little from column A and a little from column B. Let's dig in. Warning: major spoilers ahead for Shazam. Read on at your own risk. The first post-credit scene takes place about midway through the credits. Those who were paying attention during the movie may have recalled seeing a peculiar worm in a jar in the wizard's lair, known officially as the Rock of Eternity. Later on in the movie, sharp-eyed viewers may also have noticed that the very same worm was no longer in his jar, which factors into the movie's most important end-credits sequence. The end of the movie sees the Shazam family best Dr. Sivana. During this scene, the movie's main baddie is in prison, confined to solitude, hopelessly scratching at the walls in an attempt to possibly regain his powers. Then a voice emerges from the shadows. We come to find out this bellowing voice is, peculiarly, the very same worm, who utters this ominous phrase to Sivana. "You assume there's only one way to gain magic. The Seven Realms are about to be ours." So who is this seemingly powerful little creature? This is a character known in the world of DC Comics as Mister Mind, and he dates all the way back to 1943. Mister Mind, as the name implies, has the ability to control people's minds. He can also spin super strong silk and has some level of invulnerability. He's also, more importantly, a member of the Monster Society of Evil, a relatively obscure villain team made up of equally obscure members, such as Ibac and Captain Nazi. Though, it's worth mentioning that Black Adam has been associated with this group in the past. So there's a chance we could be building to said bad guy team. However, what's more likely has to do with Mister Mind's more recent turn in DC Comics, which sees him teaming up with Dr. Sivana in order to gain control of the seven realms of magic. In any event, this is a powerful, ambitious lil' bad guy who now has a potentially very powerful ally. Moving on. Those who stayed all the way through the credits were treated to one last little gag. 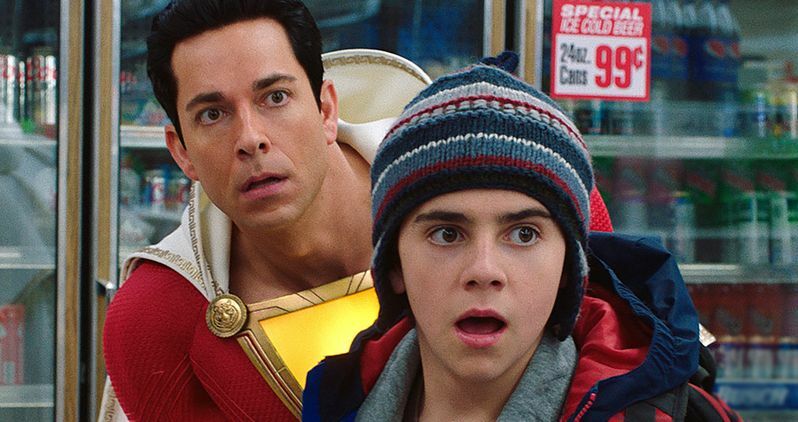 This particular scene has far less importance as it may or may not relate to a possible Shazam sequel, but it's still pretty fun. We cut to Freddy and Billy, in his superhero form, hanging out in their bedroom testing some more of his potential powers. We see the titular hero holding a goldfish bowl, seeing if he can talk to and command fish, like his DC counterpart Aquaman. We quickly learn that, he cannot. Then the hero takes a bit of a jab saying, "Well, that's not that cool." This scene doesn't carry much meaning, other than being a loving nod to Aquaman. But it's clear there are some threads to pull for Shazam 2, should it end up happening. Unfortunately, as far as we can tell, there were no direct references to Black Adam in these post-credits scenes, so who knows when Dwayne Johnson is going to suit up and duke it out against Zachary Levi. We may well see him fighting a powerful worm first. Sure, why not? Let's get weird. The Warner Bros. release Shazam is in theaters now.